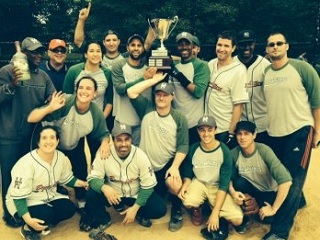 Last year's champs will take on WNYC, while the other semi-final pits the Wall Street Journal against Forbes. 1) The Journal used to own the Bonghitters. In 2010, 2011 and 2012, the daily paper beat the monthly magazine for the NYSML championship. But last year, it was finally High Times’ turn to raise the trophy. So all eyes tomorrow will be on the possibility of a rematch between the league’s top two rivals. Ha ha. Good luck to all four teams! The NYMSL home page standings list only the league competition matches. Friendly matches against other media team opponents are not included. Per the Commissioner’s comment below, Bloomberg was correct! WNYC held a lead until there were two outs in the seventh inning. But an infield error allowed the tying run to score, knotting the game at 5-5. Four innings later, in the 11th, WSJ pushed the winning run across on another botched infield play.